Time 4 Mass Gain is a nutrient dense high protein, high carb, low fat formula aimed at anyone who wants to increase muscle mass. Carbohydrates come from Cluster Dextrin and Maltodextrin which the body absorbs easily and will help to provide energy for your workouts. Protein comes from Whey Concentrate, Whey Isolate and Micellar Casein giving a time release effect so you get a drip feed of muscle building amino acids into the bloodstream for up to 8 hours ensuring optimum growth and recovery. Time 4 Mass Gain benefits from high levels of BCAA’s Peptide Bonded Glutamine and L-Glutamine to help with the recovery process. When you mix the protein and carbohydrates together in the same meal you minimise the chance of the carbohydrates being stored as fat. Protein is harder for the body to process, so it increases your metabolism. Also, carbohydrates help transport the nutrients from protein to the muscle cells which aids in muscle growth. To gain mass you will need to consume 4-6 meals a day aiming for approximately 1.5g protein and 2.3g of carbohydrate per pound of bodyweight and fats at 20% of total calorie intake. Amino Acids are the building blocks of protein and Branch Chain Aminos account for 1/3 of all muscle tissue. These Amino Acids cannot be synthesised by the body so must be sourced from our diet or supplementation. 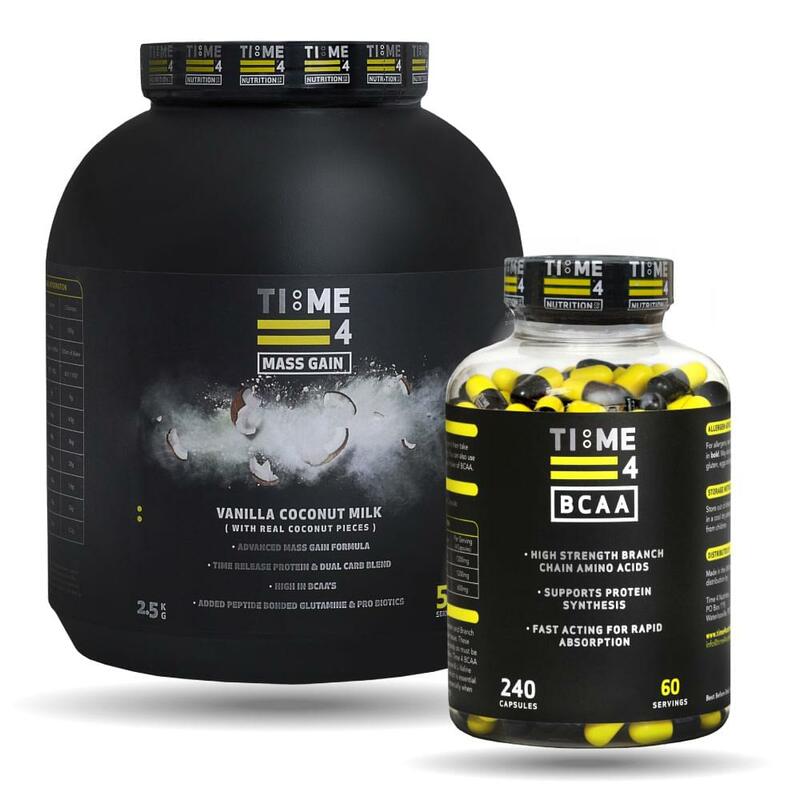 Time 4 BCAA is a 2:2:1 ratio blend of L-Leucin, L-Isoleucin, and L-Valine and can be absorbed quickly by the body which is essential for optimum recovery and muscle growth especially when taken immediately before and after training. 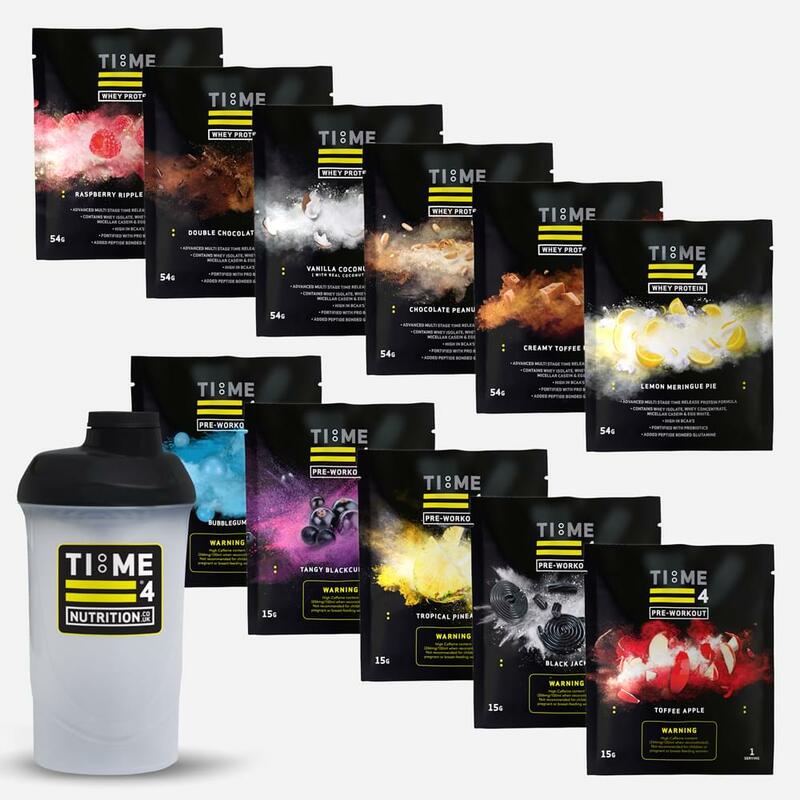 Time 4 Mass Gain can be used anytime of the day as a meal replacement or in between meals. Mix 1 heaped scoop (50g) with: 500ml of skimmed milk. Mix 2 heaped scoops (100g) with: 500ml of cold water. 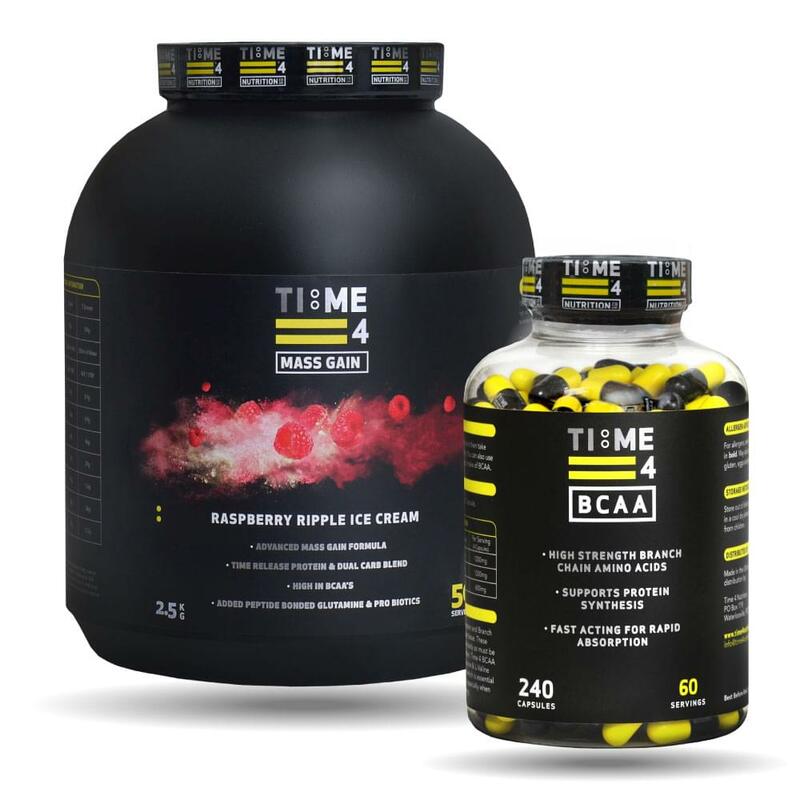 Time 4 BCAA: Take 4 capsules 20 minutes before training and then take another 4 capsules immediately after training. You can also use BCAA inbetween meals to boost your intake of BCAA's.